The TOK Band SK Mark is a high-quality bituminous joint tape made of polymer-modified road bitumen with excellent stretch and adhesion properties. The TOK Band SK Mark is unilaterally provided with a full-surface, homogeneous adhesive layer (smooth side) and additionally on this side with a protruding "nose" on the upper edge. The TOK Band SK Mark is a high-quality bituminous joint tape made of polymer-modified road bitumen with excellent stretch and adhesion properties. The TOK Band SK Mark is unilaterally provided with a full-surface, homogeneous adhesive layer (smooth side) and additionally on this side with a protruding "nose" on the upper edge. It can therefore be adhered to the "cold" joint flank quickly, safely, precisely and without using a gas burner. The TOK Band SK Mark can be applied to the expertly cleaned, dust-free and dry flank without priming. The slightly profiled (wavy) side of the bitumen tape marks the side without adhesive coating. Later on, the "hot" asphalt mix will be added to this page. According to the ZTV Fug-StB bitumen joint tape may only be installed in dry weather and a surface temperature of the asphalt surfaces of at least + 5 ° C (+ 41 ° F). At temperatures from 0 ° C to + 5 ° C (+ 30 ° F to + 41 ° F) work can only be continued if additional measures are taken (eg preheating the flanks). For the processing of bitumen joint bands solid, flat, rectilinear flank surfaces are required. The connecting flanks must be folded, finely milled or cut or consist of prefabricated components. They must be free of impurities. Rust particles from steel parts must be removed. Adhesive residues should be removed with a wire brush or compressed air. The flanks must be dry. If the requirements for the connecting flanks are fully met, the TOK Band SK Mark can be applied to the flank without a primer. The test certificates according to the TL / TP Fug-StB have been provided. If necessary, the primer TOK SK Primer can additionally be used to optimize the adhesion of the bitumen joint strip to the flank. Depending on the weather, the skimming time of the TOK SK Primer in summer is only 3-5 minutes, which allows you to continue working quickly. The TOK Band SK Mark simplifies professional laying thanks to the profiled shape of the band. The tape is also "hung up" on the flank top, so to speak. The profiled "nose" on the profile has the additional advantage of the additional share of material that grain breakouts on the flank upper edge are sealed even better after the rolling process. The "rivet head" is thus made even clearer and safer. For non-rolled connections, the conventional TOK Band SK should be used. The TOK Band SK Mark is simply designed with the adhesive layer (smooth side) upwards on the prepared connecting flank. The release paper should only be removed immediately prior to installation. The designed TOK band SK Mark is firmly pressed with the adhesive layer (smooth side) to the connecting flank by hand or an auxiliary tool. 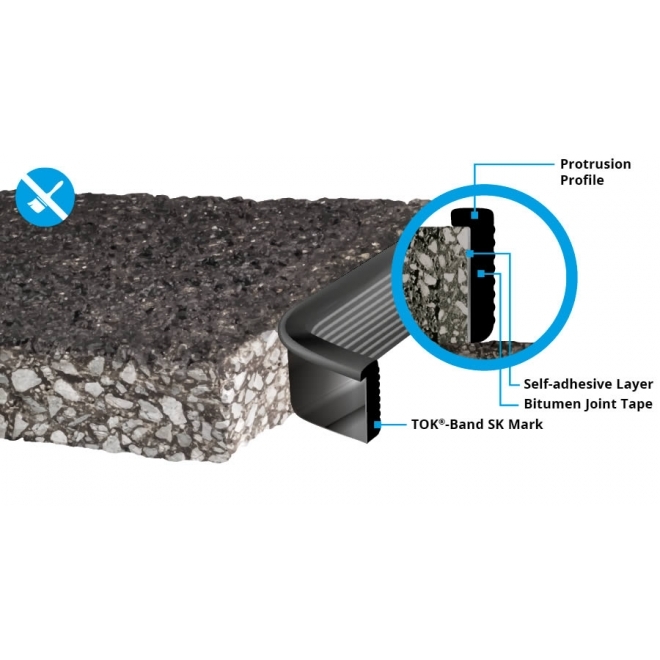 According to the ZTV Fug-StB, bituminous joint strips must be laid on rolled asphalt cover layers with a 5 mm strip overhang so that a so-called "rivet head" is formed when the asphalt is being rolled. This forms an additional seal on the surface and a clean "closure". In poured asphalt surfaces, the joint tape is installed flush with the flank. The width of the joint tape must be at least 10 mm. According to the ZTV Fug-StB and the TL Fug-StB, the material quality must be externally monitored and identified by the application of the Ü-mark (proof of conformity) on the packaging. Store dry, without load and frost-free under normal conditions (ideally 15-20 ° C / 59-68 ° F). Under these conditions, the TOK Band SK Mark can be stored for at least 2 years in the unopened original packaging from the date of manufacture. The TOK Band SK Mark is delivered rolled up in a screw shape. Depending on the cross-sectional shape, the screws are separated by silicone paper - in boxes of dimensions (wxdxh) 370mm x 370mm x 160 (or 144) mm. Each 30 boxes are packed on a Euro pallet (800 x 1200 mm). The high-quality bituminous joint tape made of polymer-modified road bitumen, which has very good stretch and adhesion properties. The TOK-Band SK has a self-adhesive layer on one side and can therefore be laid quickly and safely. The TOK-Band SK and the corresponding primer TOK-Primer SK has been tested according to the TL / TP ZTV Fug-StB 01 and fulfills the requirements of these guidelines.